Congratulations to our netball team on winning the Mid-Down Small Schools Tournament and completing a unique treble in our school's history. This year the girls have gone undefeated winning the Castlereagh Primary Schools' League and the Moneyrea Tournament added to this latest success. On a glorious day the girls played some awesome netball, with huge performances all over the court from defence through centre court to our sharp shooters up front. Player of the tournament was team captain and centre Emma, who led the team by example throughout the season. 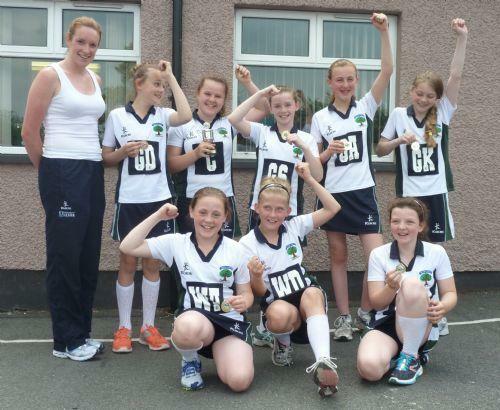 In the final the girls played against a very strong Killinchy side who started off the day as tournament favourites. The first half was an end-to-end affair with the teams sharing eighteen goals with neither team willing to give any quarter. the second half proved to be fiercely competitive but played in a very sporting manner. Eventually Moneyrea managed to open up a five goal lead with their slick passing from centre court to attack eventually proving decisive. Both teams exhibited great skills throughout the match with Moneyrea running out winners by 17 goals to 12. Shooters Freya and Holly are deserving of a mention as was a gritty performance by Goal defence, Phoebe. This is the second year running that the girls have won this prestigious tournament. The trophy was presented to the team captain by the current Northern Ireland netball captain, Gemma Gibney. In addition Leah and Stephanie received sportsmanship medals for their contribution. In the B team competition our girls performed admirably, winning three of their four matches and narrowly missing out on a place in the final. notable performers were team captain and Wing Defence, Katie, Centre, Helen and shooters Sarah and Stephanie. Well done girls and congratulations to coach, Mrs Floyd.